Thursday, June 29th through Sunday, July 2nd, 2000. Many thanks for your letter dated 14 January 2000. 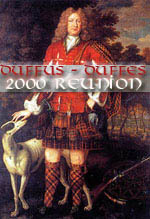 These are just a few lines to wish you and all other Duffus's who attend the reunion a very happy time and to hope that the weather will be kind during all your activities. My wife and I accompanied by my eldest sisters visited the village and castle on a few days in August 1997. We were very impressed with such a beautiful village and how well the remains of the castle are being kept in good order. I had my video camera with me and it is nice to look back on our visit. Unfortunately, my wife and I will not be able to attend the reunion as we are both employed by the education department here in Darlington and are unable to have time off work. Also, it would be such a long journey to attempt on Saturday and Sunday. Once again we wish you A HAPPY REUNION. P.S. Enclosed a couple of photographs taken on our visit to Duffus. Click on image to see video!!! Thank you for your letter of June 1st. I can confirm that I shall be able to attend at Duffus Castle at 10:00 a.m. on July 1st and shall look forward to meeting you and the Clan Duffus. My wife and I would be pleased to accept your invitation to the Ceilidh at Duffus Village hall on the evening of July 1st. 8672 N. Bobby Jones Dr. Here is some of the data that we talked about. I intend bringing more with me to Elgin. I'm also trying to borrow another lap top, mine just doesn't hold a charge, and then I can show much of my heritage to the Scots thru the monarchy. Although, I'm not to sure that Scots are all that enthusiastic about British heritage even if it does go back to my 28G-G parents King Malcom and St Margaret. 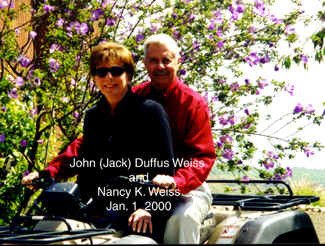 I've enclosed a picture of my wife Nancy and me taken @ the New Year at our son's avocado farm in CA. By the way, if you look at the last 3 issues of Money magazine, there is a very nice article in April, as one of the top 10 money mgrs. of the decade; a 2 page ad right after the cover in May and then he has one of the top 100 funds in the June issue. 2.Several pictures of me in the Navy, my mother and grandmother and my Uncle Jack, who helped raise me. 6. The newspaper obituaries on my GF and his brothers. You know I'm hoping that when I get to Edinburgh that between Merchiston Castle school and perhaps military records I can pursue my GF's ancestors. After all there are 2 Generals and a Col. In the old days, family was important to becoming a General to the detriment of many battles! 7. Pictures of Chester, who received the MC and his sister. 8.Pictures of the Duffus Castle during my visit in Oct 90. One last thing, please explain what you did to make my disk work on your PC? Click on photo for articles and photos of family!!! 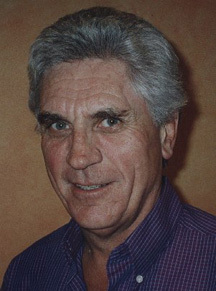 Webmaster's note - I found this picture of Bill Duffus on the internet at http://www.interiornet.co.za/billduffus.htm. I assume this is the same Bill Duffus who sent me the following email. I am referring to your letter dated 11 May 1999. This had inadvertently been filed away at our Guild Office. My apologies for the delay in replying. 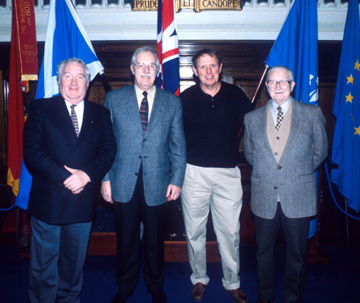 I had, however, heard about the gathering from cousins in Scotland. I was on a short visit to St. Andrews, Scotland late in March for my parents 60th wedding anniversary. My cousins are in fact having a family get together in Moray at Easter. They mainly live in the Elgin area and I think the venue is Duffus Hall. I am keen to attend the Duffus Castle Gathering on 1st July but I have previous commitments in South Africa, namely the Grahamstown Arts Festival which is a business trip for me. Did you source many Duffuses in South Africa? I am aware of a few although none are related to me. I am an immigrant to S.A. in 1974. If I can be of help, please contact me. I am aware of two brothers both photographers from Scotland who founded the first photographic society her in the 1890's. I plan to visit Museum Afrika to get information on this which will be passed on to you. Having seen a photograph of these brothers I reckon they could be distant relatives on mine. My email address is "insidestory@anet.co.za". Please let me have your email address. I shall visit the website soon.